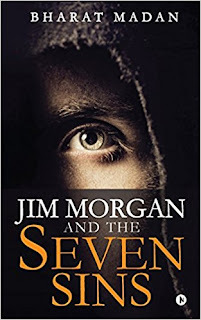 On the outskirts of New York City, Jim Morgan, an international bestselling author learns through God that he had committed seven sins in his previous life. Clues lie in the six novels he has written, that would lead him to the mystery. But the novels won't reveal everything to him. With seven days on hand, he must walk in the direction that faith leads him in, to reach the lost chamber of Seven Planets. Unless Morgan understands the secret behind his past life and the sins he committed, his chance to live will be lost forever. 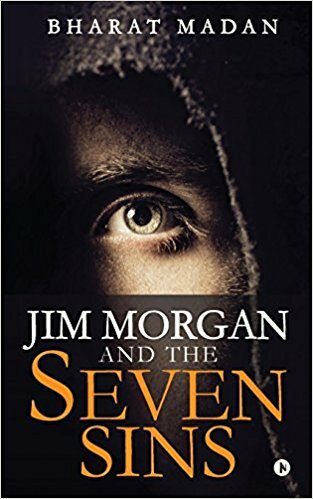 “Jim Morgan and the Seven sins” has a very different story line. Its dark, mysterious and very well thought of. I was very keen to read this particular book because the plot is very fresh. When I dived in the book I was wondering how the story would move, luckily the action starts in the first few pages itself and the great images of mystery and drama emerges. It was nice to read something like that. I love stories which have a higher power that guides you or rules the scenario. Everything just glorifies by that factor. I didn’t like the main character very much because he was just not doing justice to his persona. He was more into boasting about himself rather than focusing on the happenings. Also I think that the story is a little dizzy somewhere in the middle. I can accept that behavior in the starting of the book because at that time there is a lot to explain and connect with but that is unacceptable in the middle because it is the high point. The book follows the trend of the beginning and it is extremely slow and not to the point. The main idea, i.e., the sins are not presented in a lavish manner. It was like one sin is mentioned in a highly impressive manner and the other is not even showcased in a confined and neat way. What is great in the book are the side characters, some of them were amazing and it was nice to see them in action. The problem was that only Jim seemed to be the main character and nobody else was there for an ample amount of time. So it was hard to connect with them majorly and as so many characters were coming from time to time it was not easy to think about Jim and his mindset. But I loved the scenario. I loved the time travel so much that I waited for it so badly. And because of that particular reason I was not able to put the book down. There were very strong connections, very well executed turns and a very sharp reflexes. The main problem in the book arrives is the narration and so many characters that comes in play from the very start. It became a little confusing and out of the box thing. Maybe it was because of a glitch in narration or execution of the tale. But if I neglect that then there was no issue at any place and my reading experience of the book was amazing. The book is not small still I managed to read it quickly because the interest quotient was so high, I was so desperate to know the mystery that sometimes I used to jump ahead a bit to get to know what’s next. It was a balanced novel for me which entertained me at right places in right amounts. So, it was a good pick. I can easily recommend this book to people who read Indian authors and are bored from romance and stupid thrillers. Jim Morgan has something different. Bharat Madan is an author, motivational speaker and a personality developer. He has been a meritorious student through his time at college and holds an MBA from Amity University. He received the prestigious Shree Baljit Shastri Award and Best All Round Student Award, the highest awards at his university. His journey as a writer began after he finished his education. His first piece of fiction, the story of a college boy over three years, was set aside in favour of his decision to make a debut with a more mature and conceptually unique novel. As a motivational speaker, he has inspired thousands of students in reputed schools in Jaipur. Through his writing and speaking skills, Bharat endeavours to add value to the lives of students and make their personalities forces to be reckoned with. After pressing demands from his listeners, Bharat started a Youtube Channel called “Bharat Madan” to share his ideas through the digital platform. He derives inspiration from his mother who raised him single-handedly after he lost his father at a young age.